The Department of Technical Education is conducting admission of Candidates into various diploma level Engineering and Non-Engineering Courses who passed SSC or its Equivalent and qualified in TSPOLYCET (formerly CEEP (Common Entrance Examination for Polytechnics)). During the last year 39000 seats were available for the candidates and since there is a great demand for skilled supervisors in various industries, Government has decided to increase the seats to nearly 60000 by establishing new polytechnics and conducting second shift in polytechnics and private engineering colleges. 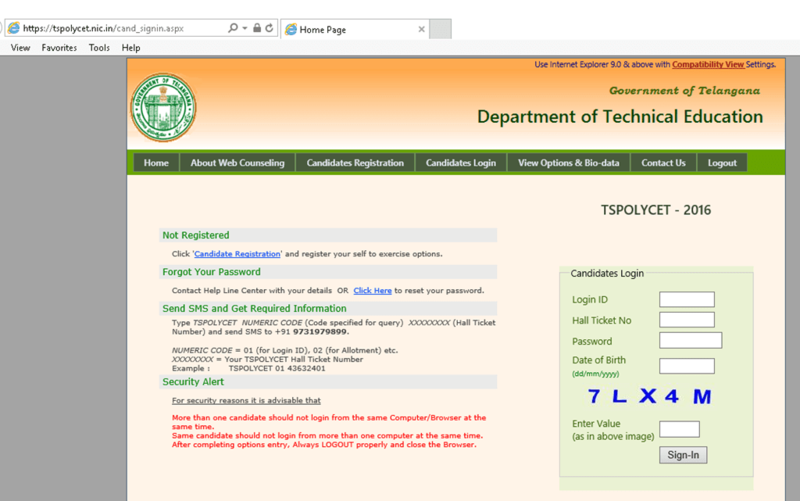 The process of inviting the qualified candidates of TSPOLYCET (formerly CEEP) and allotting a seat as per their option is known as Counseling. In the past, candidate used to attend in any one of the 8 Counseling Centres for securing a seat in a polytechnic. In this process candidates have to travel all the way to report at any one of the counseling centres more than once and it is also a time consuming process. For the Convenience of the Candidates from the academic year 2009-10, Government has decided to adopt a total web based counseling procedure where a candidate can exercise options i.e. candidate can select a polytechnic and course which he/she intends to study, through internet centre or internet facility available at his/her residence and where access to such facility is not available, from any one of the help line centers established by Govt in the districts. Such help line centers will be availble in each district. 1. Issue of Notification: The Director of Technical Education (DTE) issues a notification every year, during first week of June, in all prominent news papers indicating the date wise ranks of the candidates who have to attend for Registration, Verification of Certificates and Schedule for Exercising options and DTE will also notify the list of Help-line Centres. Candidates who fail to report for registration and Certificates verification will not be considered for allotment of seats in any of the polytechnics. f) Income Certificate issued by MRO issued after 01.01.2016 should also be submitted (in case the candidate desires to claim fee reimbursement). 3. Exercising Options: After Certificate Verification in Help-line Centres, a Blank Option Form (speciman), List of Polytechnics with the courses offered by them and course codes will be given to all the Candidates. Based on the Course Codes and polytechnic Codes, Candidates may list out polytechnic in order of preference, the courses which they intend to give options for. For the reference of the candidates , the last rank up to which candidates were admitted in different polytechnics/courses in the previous academic year would be made availble to candidates on the web site. The candidate should first prepare a priority number with a list of courses in the blank option form before he/she attempts to enter the options on the web. Candidates can exercise any number of options. After the finalising the options, he is advised to take print out of the final option form for his/her record. Help-Line Centres shall demonstrate the detailed procedure of Exercising Options immediately after the certificate verification. 4. Final Allotments of Seats: Based on the options excercised, seat allotment will be made as per merit rank and category (SC/ST/BC/PH/NCC/CAP/Sports and games quota etc ) of the candidate. The final Allotments will be placed on the Web on the scheduled date announced before hand and the Candidates will have to down load the allotment order from the web site. 5. Payment of Fees & Reporting at Polytechnic: Candidates, with downloaded allotment order, have to remit the fee in one of the designated banks and obtain a receipt. After that candidate with allotment order and Fee receipts have to report at the respective Polytechnics where the Seat is allotted on or before the dates specified in the allotment order. If Candidate fails to report for admission at the allotted polytechnic by the dates stipulated, the allotment stands cancelled and candidate will have no claim for further allotment of seats.